How do I view account settings in Commons? As a Canvas admin, you can access account settings in Commons to manage public sharing and importing options for your account. Canvas account admins are automatically made account admins in Commons. Non-admins (instructors, designers, etc) will not have access to Admin Settings. To access Commons Account Settings, click the Admin link. 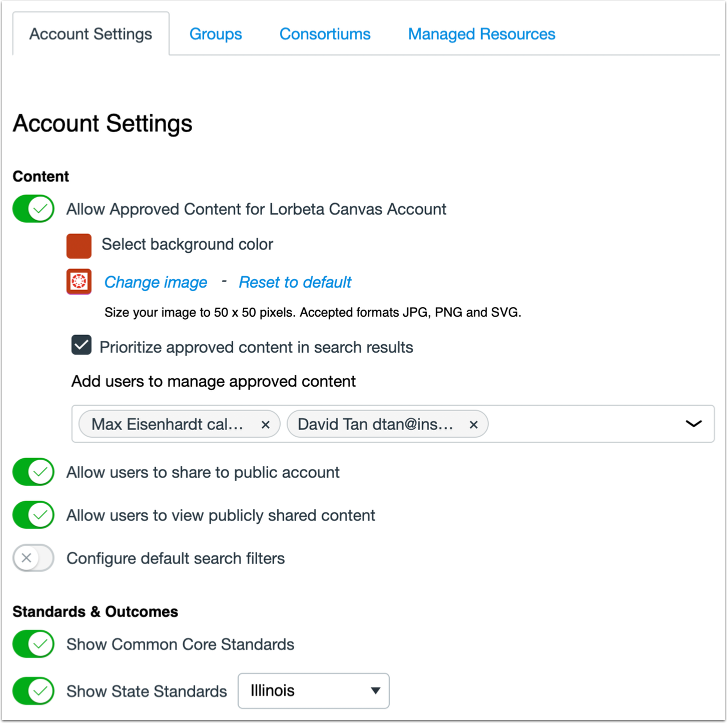 In the Account Settings tab, you can allow approved content settings, manage sharing settings, and configure default search filters. You can also enable or disable standards and outcomes. By default, Standards & Outcomes settings are enabled. You can edit your account settings at any time. In the Groups tab, you can create and manage groups with which you share resources. 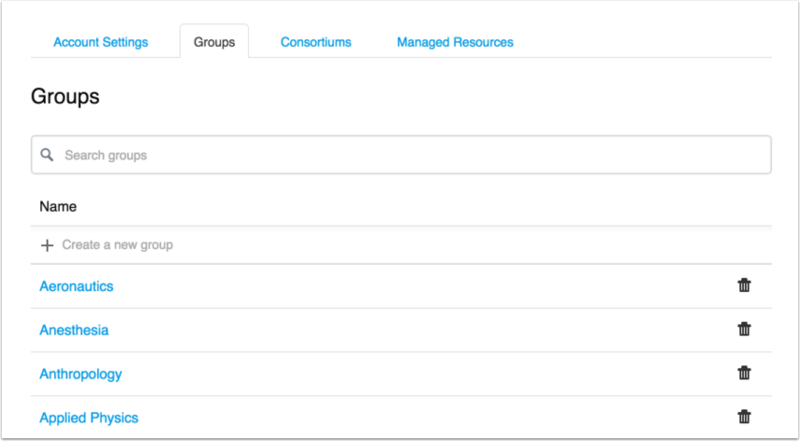 In the Consortiums tab, you can create and manage consortiums with which you share resources. 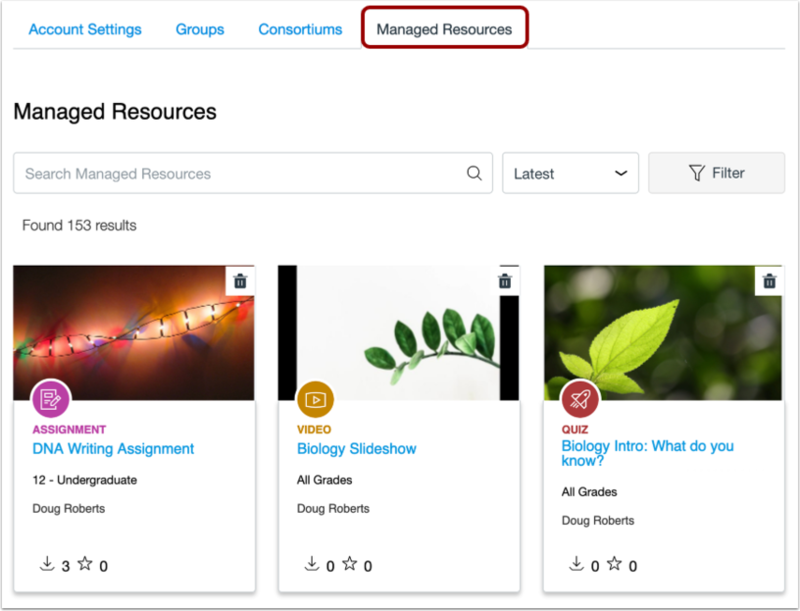 In the Managed Resources tab, you can search, view, and remove resources shared by your institution that are not private to the author/sharer. You can also edit resource metadata (details, content licensing, share option); however, you cannot edit or update resource content. Previous Topic:How do I manage Groups in Commons? Next Topic:How do I edit my account settings in Commons? Table of Contents > Admin Users > How do I view account settings in Commons?